She successfully attempted to connect the ancient goddesses with the contemporary. In a solo dance narrative, the artiste loses track of time, but in her case, she had transcended time and was still in touch with the contemporary goddess. The contemporary goddess is the outcome of politics of religion, media-management and commercialization of beliefs and practices. Taking note of these facets, Dr. Ratnam skillfully maneuvered this journey of the feminine from the ancient to the contemporary. Boundlessness of the dance within the boundary of the stage is a stark antithesis of her performance, which heightens dance not just as an art form but as a medium of communicating self-expression, ideas and imageries. A contemporary classical artist like Dr. Ratnam, seamlessly integrates the theoretical framework of an academic with the music, movements and expressions. The two-day seminar at Jnanapravaha (the space for cultural enquiry) was so aesthetically carved out that the costume changes using contrasts of vibrant and subtle colours enabled the audience to get the feel of the dichotomy between the transcendental and mundane. Such vibrancy is much-needed in the Indian academic field to communicate complex concepts and ideas in a holistic manner. To enrich and contemporize Indian knowledge traditions, it is essential to undertake an integrated approach combining the three Ps - Philosophy, Poetics and Performing Arts. The efforts of Dr.Anita Ratnam on these lines were path-breaking and exemplary. 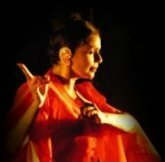 Two evenings, over 5 magical hours, saw Dr. Anita Ratnam, an internationally acclaimed neo-classical and contemporary dance-actor, approximate the "ultimate and impossible." To capture the essence of the Divine Feminine, to communicate Her Infinity, to portray Her myriad forms and moods, requires rare courage, penetrating insight and intense devotion. Anita combined these qualities with her profound knowledge of not only the movement arts, but also the literary and the aural. 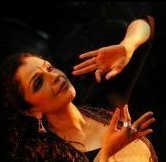 Weaving texts, traditions, legends, histories with canonical music and verse, she took the audience on a captivating journey of evolution and involution. Beginning with the exploration of space through the Sri Chakra and ending with Tara in whom all dissolves, she systematically narrated multiplicity through Lalita Sahasranama, and individuality through iconic Mahalakshmi, Saraswati, Annapoorna. The historic and poetic Sri Andal and Meera Bai were painted through Shringara and mythic Yashoda through Vatsalya. Awesome possession and uncontrollable valour were delineated through Amman and Minakshi. Liquid Goddesses – Ganga, Yamuna, Saraswati were objects of poetic veneration. The unexpected satirical rendition of the modern and contemporary woman was the culmination of another trajectory, circling into completion the attempt to connect with the Goddess. This performance – discussion was an unparalleled method of understanding "HER and BLISS" through chapters. The 2-evening performance-lecture by Anita Ratnam at Jnanapravaha, "HER and bliss... in chapters" made many journeys simultaneously. The structure of myths, motifs, symbols and performing art came together clearly and strongly - bringing out the role of visual and performing arts in the way we understand our myths and symbols, our history and world. When we study myths and motifs through visual arts, there is a way in which we assume the journey from idea to image, the same journey made through dance and movements highlights and throws to the fore some very different and interesting aspects of the journeys between idea and image, back-and-forth. This journey gets further emphasised as Ratnam explains her own experiments and personal engagements with movement, costume, props and choreography. One thing that I personally enjoyed was to see choreography and motifs carving out space as image, where clearly the space as image even extends beyond the conventions of three dimensions, extending into expressions and memories of stories, spaces, places, themes and ideas.